A white Christmas might be unlikely in Notting Hill, but you can get a whiter smile to show off in those family Christmas photos. But is there a way to get whiter teeth naturally? We explore the options. Some teeth whitening toothpastes and chewing gums can help to remove surface stains from your teeth. However, not all prioritise your dental hygiene, so we recommend only using those approved by the British Dental Association. They can also take a few weeks for results to be noticeable, so they’re not the fastest solution if you want to get whiter teeth for Christmas. Can some foods help whiten teeth? A study at the University of Grenada, in 2013, found that malic acid – present in strawberries and apples – is also used in some toothpastes. Its astringent properties also mean it encourages saliva production, which helps clean your teeth. Christmas is the perfect time to indulge in festive fruits like clementines and oranges. Alongside grapefruit, citrus fruits boost saliva production to clean the teeth. However, they’re still very acidic so we recommend drinking water after consuming. This tropical fruit contains bromelain – an ingredient found in whitening toothpaste which has cleansing and anti-inflammatory properties. Raw fruit and veg, such as apples, celery, carrots and broccoli, can help keep teeth clean by acting as a gentle abrasive. The less plaque build-up and enamel erosion, the less your teeth will appear yellow. Seeds and nuts also have a hard texture which helps to remove plaque from the teeth. However, they can get lodged in gaps or crevices, so drink water to help remove particles. Calcium-rich cheeses, milk and yoghurts don’t just help strengthen teeth and bone enamel, they also stimulate saliva to help neutralise acid and prevent bacteria forming for cleaner teeth. A healthy diet rich in watery fruit, veg and calcium will help keep your teeth clean better than foods high in starch and carbohydrates. But we think they’re best considered as a way to keep a healthy smile all year round. Like whitening toothpastes, they also won’t give you the same beautifully white results as a professional teeth whitening treatment. Or as quickly. And as the clock ticks down to party season, who has time to wait? You can get whiter teeth in time for Christmas with our Notting Hill teeth whitening treatments. These safe treatments take from just 30 minutes a day and last from 10 to 14 days. You can also choose from treatments to apply at home, in the surgery or a mix of both. Find out more about teeth whitening in London. 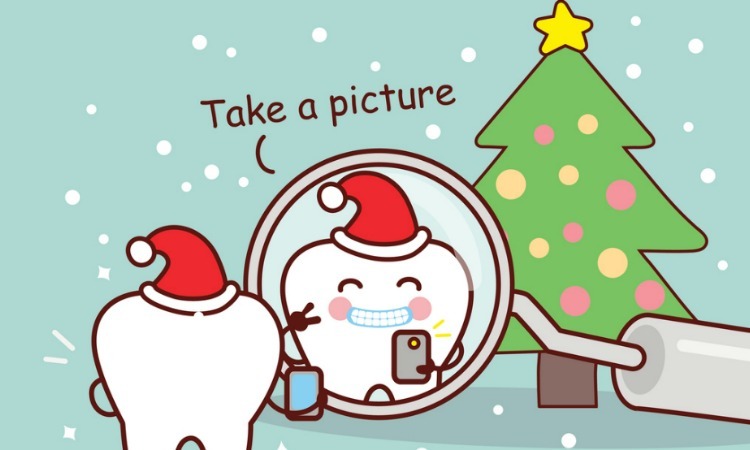 To ensure whiter teeth in time for Christmas, contact us at Number 18 Dental to book your appointment. ← Could brushing your teeth prevent a heart attack?